This album is a musical picture of how I feel about Kirby Super Star. It includes a wild 10-minute air ride through Dream Lands, which goes to show that no one should ever underestimate the adventures of the pink fluffball. Kirby Super Star is a game which is very dear to me. It might look simple to the untrained eye, but it's a game with an incredible amount of depth. There are so many ways to enjoy this game, especially when playing with a partner. I can only recommend it. 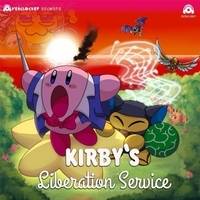 This album is some sort of a musical picture of how I feel about Kirby Super Star. From the hyped title screen music to the groovy Dynablade world map, and from the chill-but-tense Cocoa Cave to the complete insanity of Marx's Theme, I wanted to cover most of the emotional range of the game in a package as compact as possible. And this includes, among other things, a wild 10-minute air ride through Dream Lands, which goes to show that no one should ever underestimate the adventures of the pink fluffball. Finally, this album is dedicated to my amazing friend Marc-André Parenteau, for all the countless times we beat Kirby Super Star together all the way back since second grade. Best co-op couch game, best friend, 10/10 would childhood again.